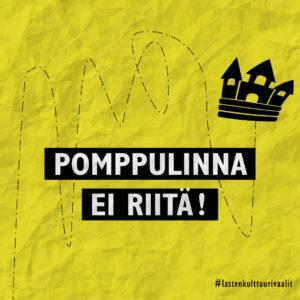 In Finland, municipal elections are held every fourth year to elect local government members in the councils of municipalities and cities. 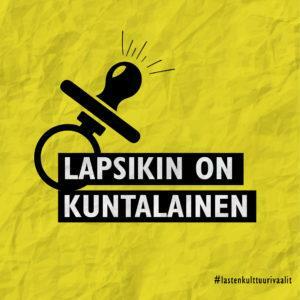 In the municipal election in 2017, the Association of Finnish Children’s Cultural Centers and its members carried out a campaign with the purpose of increasing the voters’ and the politicians’ awareness of social issues which are connected to the welfare of children, adolescents and families. The campaign consisted of eight statements which were distributed in social media. The main theme focused on the right of children, adolescents and families to culture. Listening to children and adolescents and cherishing art, culture, upbringing and tuition are investments in the future of municipalities. The cultural centres for children produce first-class cultural activities, promote humane values and build up community spirit in municipalities. A jumping castle is not enough! Children’s culture must maintain a certain standard and strive for artistic excellence. Article 31 of the UN Convention of the Rights of the Child includes the child’s right to participate in cultural life and the arts. The cultural offering for children in municipalities must be more than just a jumping castle and facial paintings. The child has the right to art performed by artists and to art activities led by professionals. The professionals are aware of the specific features of various art forms, and the activities leave room for different thoughts, emotions and experiences. The cultural centres for children offer culture for children on a professional basis. Children must be heard in decision-making that concerns them. Municipalities need to make sure that children and adolescents are heard in decision-making relating to them. The child is the expert of his/her own childhood and life. Decisions and their implications must be discussed with children and adolescents. For instance, economic cuts in schools and early education are reflected in childhood and youth. The child’s perspective should also be taken into account in environmental design, and children and adolescents should be included in the planning of public premises. An environment build by adults for adults looks very different in the eyes of a child.